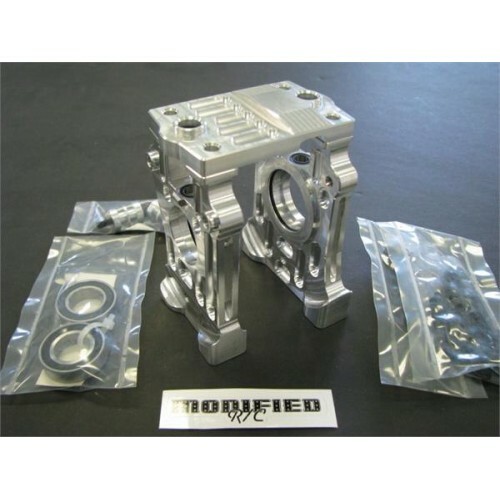 This center diff mount set features extra wide feet on the top and bottom of the uprights, this prevents rocking when the diff mount contacts the clutch housing during extreme chassis flex. Bearing removal is made easy with the use of O-rings in the bearing bores, they allow a nice snug fit without using a press fit on the aluminum bearing bores. Two huge 15x28x7 diff bearings, the rear bearing has a custom inner race modified for this application. Four brake actuator bearings(top and bottom, front and rear). Four different sets of brake screws so you can run single or dual brakes on the front or rear, in any combination you choose. Two nylock nuts(for front) and two thin nuts(for rear) for locking the brake adjustment screws in position. 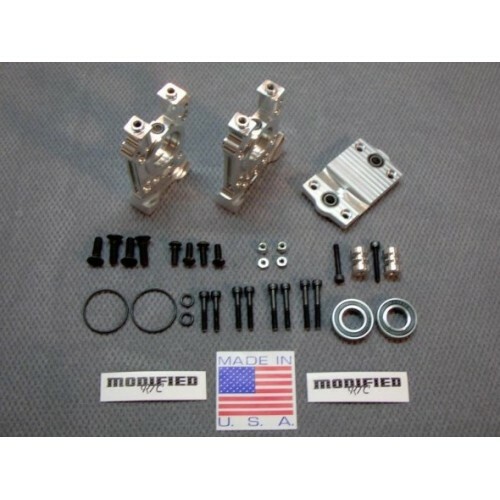 Two aluminum lower brake disc guides to keep the discs in line, they work with single and dual brakes(front and rear) and are easy to remove and attach. Four extra long mounting screws to mount the uprights to the chassis. Four extra long mounting screws to mount the uprights to the top plate. Two small O-rings that slide over the brake actuators and against the top plate, so the upper brake bearings in the top plate stay clean. 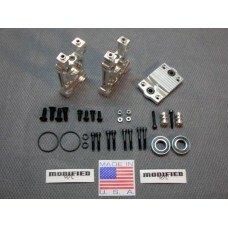 Modified-RC makes useful, quality parts for the baja and Losi.